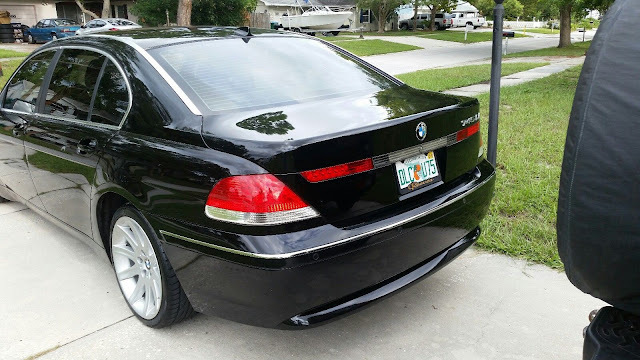 The E65 generation BMW 7-series was the first generation of BMW's plus sized luxury car to NOT be available with a manual gearbox anywhere in the world. 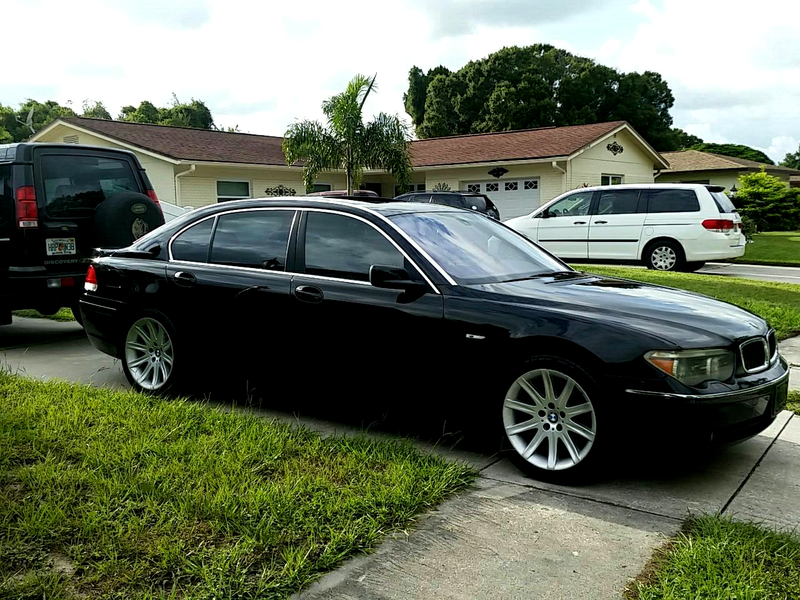 It was unfortunate to see the manual shifter go, but the number of well heeled buyers who wanted to shift their own was very limited, so if you want to drive an E65, at least get the long wheelbase E66 version. Find this 2003 BMW 745iL E66 here on eBay offered for $3,999 buy-it-now or make-offer located in Clearwater, FL. This is a beautifully crafter top of the line car, everything you would expect from a $100,000.00 car. Soft closing doors and trunk, premium sound package with logic 7 upgrade, air conditioned 20 way adjustable seats, air conditioned back seats, auto park work great, front and rear parking sensors, navigation, etc etc. this is the Li version meaning long wheel base with an extra 12" of room. it is really comfortable on trips. The car was sitting for almost a year as I purchased another BMW so the battery is brand new and super clean inside and out for its age. does have minor rock chips and light scratches on the front bumper and a small (less than a dime) size dent on one of the doors. for the year this car is in great shape. All the power shades work, foot rests for rear passenger are present, had an engine swap 2 years ago that is why the mileage reflected on the post is low. This is the powertrain mileage. Has 19" wheels with good tires and full spare tire with jack and lug wrench in the back. this car does need to have the "adaption" done by a dealer, the battery died and all the computers need to be reset. its 1.5 hours at the dealer. vehicle runs and drives, some warning lights will come on and off. this car needs a little bit of attention but it will NOT disappoint. recently learned the valve cover gaskets are leaving, its a very slow leak, but I did see a few drops on my garage floor. Note the mileage represents the engine mileage after swap. $100k car for $3999? What could go wrong?! I'm going to start with "electronics" and then let someone else continue...oh...wait...you meant that rhetorically. I worked at a dealership when this model was introduced. What a hellish experience that was. Going from the e38 to this in terms of engineering and manufacturing was like going from an Amish buggy to the space shuttle, and there were SO many issues with the CAN-bus system in this car. BMW's engineers wanted to wait to release this car because it wasn't ready for prime time yet, but in a sign of what was to come at BMW, the marketers won out over the engineers. Unfortunately for us sales schmucks, we bore the brunt of $90k car buyers discovering the hard way that they were unwilling beta testers for BMW. Lots and lots of lemon law applications and buybacks for these, but by now, most of what can go wrong has gone wrong and is known.....just don't count on a shadetree mechanic being able to fix a lot of it. @Sean - I'd like to get your opinion (and anyone else's for that matter) on what would be good choices of year, drivetrain, options, etc. I'm looking for a 7 in slow motion, mainly because it has to have a stick, which I also assume probably means it will have the smaller of the available engines. I'm actually OK with that, as the narrow roads, crazy drivers and vicious speed cameras around here drastically reduce the value of horsepower. I'm not Sean, but I have some ideas. Based on where you are, you have a lot more options than we do here (last 7 with a stick in the states was the 88 735i). Based on your needs, I'd try to find an e38 728i with a manual. All the modern luxuries and refinements of the e38 chassis, combined with straight-six goodness and reliability. (Plus you get to drive around pretending you're The Transporter). E32's aren't bad choices either, but nothing really makes them stand out above an e38----they have no more refinement or driving character, and actually less electronic reliability. If pure mechanical analog simplicity is what you're after though, just stick with an e23.....basically the same driving and ownership experience of an e28 5 series in a larger wrapper, with virtually nothing you couldn't fix in your driveway. Another vote for the e38. I am curious to see how rare they are?